DeSoto Caverns is one of the most beautiful and historic show caves in the US. Located just 36 miles southeast of Birmingham down Highway 280, you will learn about the prehistoric Indians that lived and died in the caverns, Confederate soldiers that mined gunpowder, early Indian traders that visited, and moonshine making during prohibition times. Open year-round with a cave temperature of 60 degrees, the park offers campgrounds, a gift shop with a cafe, a scenic picnic area, and pavilions near waterfalls, streams, and ponds. A laser light, sound, and water show is included in every cavern tour. We also offer over 20 outside attractions that include a maze, gem panning, crystal find, wacky water golf, archery, and more. Stop by today! The first room you will visit on your tour in DeSoto Caverns is our "Healing All Cathedral." This name has been adopted in honor of our Native American history. Over 2,000 years ago Native Americans described our largest room as having calming and healing properties, and gave it the name "Kymulga," meaning "Healing All." This room is the first room our guests experience while on our hourly tours and it's impressive size boasts heights of 120 feet tall and over 100 yards long! Caverns are often known for having tight openings and slim passageways, in contrast DeSoto Caverns has a grand first impression with its grand size and immense collection of formations. Nestled in the foothills of the Appalachian Mountains in Childersburg, Alabama, DeSoto Caverns is a site rich in history. In 1796, Benjamin Hawkins, a presidential agent, wrote to President George Washington describing the beauty of the cave, and he took note of it as America's first cave. DeSoto Caverns has played an important role in American history from 2,000 years ago to the Civil War, to the Prohibition of the 1920's, and more! And unlike many historical sites, most of the sites and sounds of DeSoto Caverns have been preserved so that you can experience what other adventurers like yourself encountered hundreds and even thousands of years ago. You'll learn more about this beautiful underground world while on your visit to DeSoto Caverns. There are over twenty attractions on the land above the cave, making DeSoto Caverns the perfect visit for those seeking adventure, the great outdoors, and fun with family or friends. Ida Mathis along with several business partners purchased the cave in 1912. Ida Mathis had a big vision for this cave, and had planned to mine it’s gem stone quality onyx. Through an unfortunate turn of events, the American market for onyx turned sour. 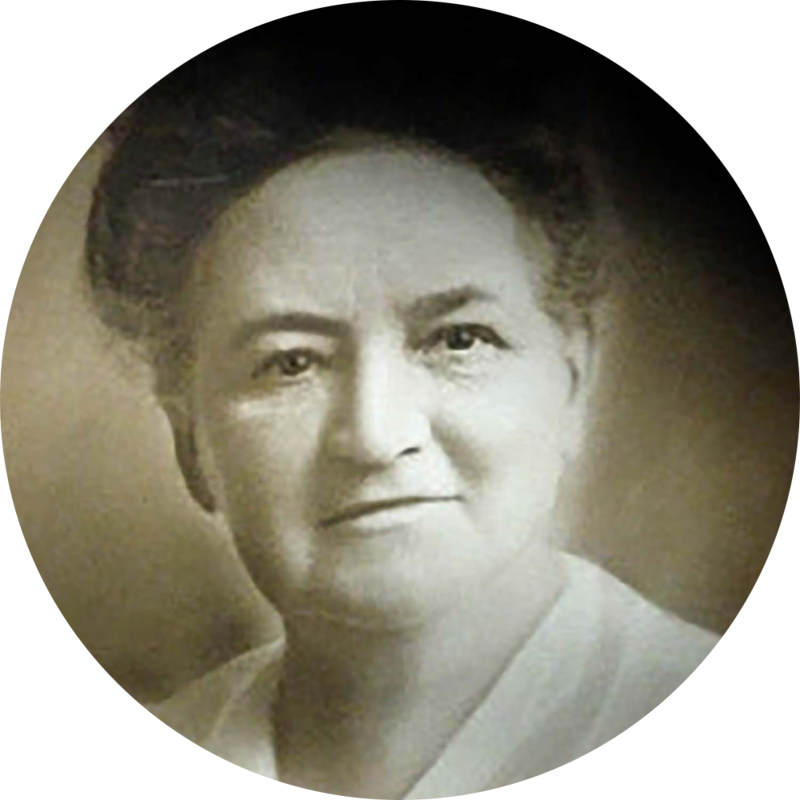 Ida Mathis felt the land had deeper value than monetary gain and purchased the other shares from the other business partners. In 1975, Ida Mathis' great grandson Allen W. Mathis III started the development of DeSoto Caverns. He and his wife Danielle are the first in the family line to open the land up to the public as a tourist attraction. They believed that their privately owned Caverns was a national and local treasure that needed to be experienced by the public. Al Mathis and his wife have worked at the park for over forty years and are still involved with the management and future development of the park. In 2015, a fifth generation of Ida Mathis’ family started managing DeSoto Caverns. Mr. Mathis’ daughter, Joy, is now the President and her husband, Jared, is the Chief Visionary Officer. They are currently collaborating with a team of incredible individuals to make DeSoto Caverns an unforgettable experience. DeSoto Caverns not only has a rich historical background, but is full of the beauty of science. 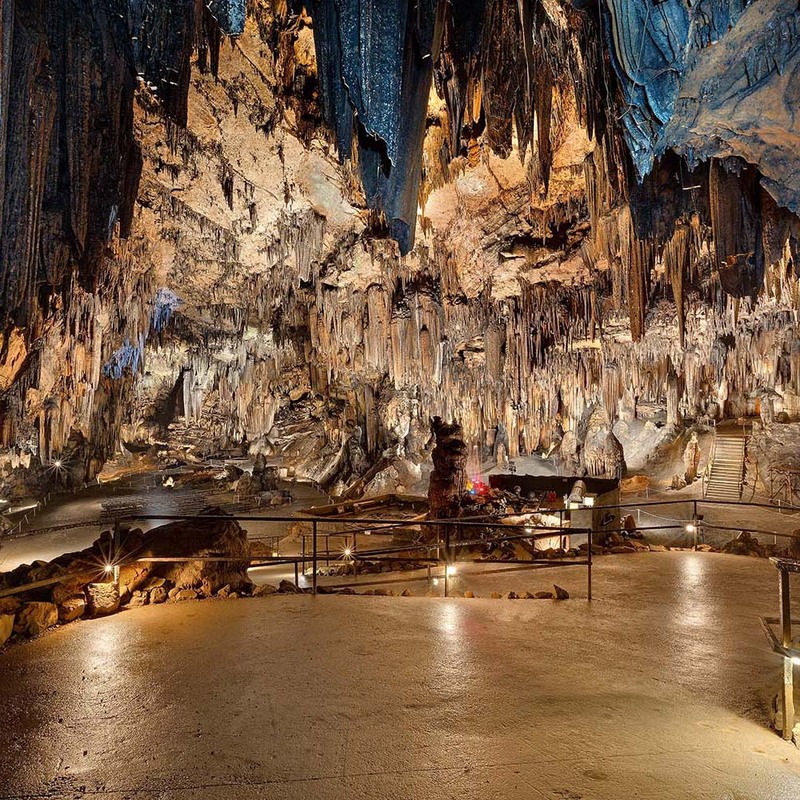 In addition to being the first cavern on record, DeSoto Caverns is also noted for having one of the largest accumulations of onyx-marble stalagmites and stalactites in the world. 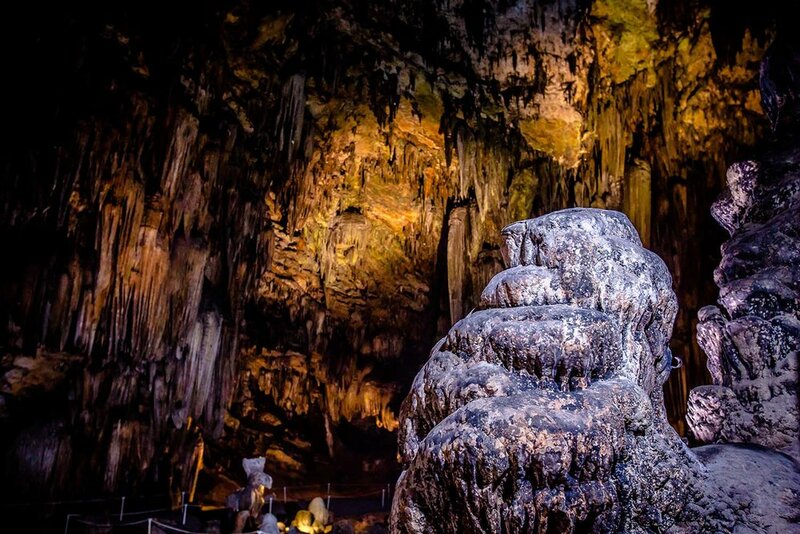 The Caverns contains many formations, ranging from the commonly known stalactite, stalagmite, and column, to the more rare formations of the Caverns flowstone, draperies, helictites, and cave bacon (yes, that's a real formation name). The artful tapestries of color on our formations speak to the rich minerals of the local area. Every color in our Caverns is the fingerprint of the nutrients above the earth. This exquisite expression showcases that the care we take in preserving our beautiful planet affects even the hidden majestic places in this world. How often do the tours go down? Every hour, on the half hour, a Cave Host will greet you outside the entrance of the Cave to take you on your Underground Adventure. How long does the cave tour last? Your guided caverns tour lasts one hour. What kind of show is included in our tour? Every Timeless Tour includes our Caverns Light show! Our show includes a lasers, sound, water, and light spectacle that is a must see! We have several different Caverns Light Shows based on seasons and holidays, so be sure to check our calendar for information on which one will take place on your tour! Is photography or video allowed inside the cave? Yes, we encourage the use of photography and video in the cave! Are strollers or baby back-packs allowed inside the cave? Yes, they are. Our cave has a tunnel, making it accessible for you and your young ones. What is NOT allowed inside the Caverns? DeSoto Caverns reserves the right to prohibit additional items that may pose safety concerns for either the live Caverns or other guests. If you have an unlisted item you would like to bring into the cave that is not listed as approved, please contact us to request approval in advance and recognize that if approval is not given, the item may not be allowed into the caverns. Is DeSoto Caverns handicap accessible? Yes, we are. We are proud to be one of the first caves to be handicap accessible throughout the entire tour! We now have a tunnel instead of stairs that leads into the caverns and there are no longer any areas of the cave where stairs are used. Because of the natural environment of the cave, some areas had to be steeply ramped and will require an additional helper to navigate. Warning: For cave visitors in a wheelchair, it is required that you bring a capable assistant to help you with navigating the steep portions of the cave. Is DeSoto Caverns open for the holidays? We are open all holidays except Christmas Day and Thanksgiving Day. Are pets allowed at DeSoto Caverns Family Fun Park? Yes, pets are allowed in the park as long as they remain on a leash. Inside the cave we only allow pets if you are capable of holding them throughout the tour. People who bring their pets are responsible for cleaning up their pet's waste. People with pets also will be held responsible for any damage their pet creates. Because of the indoor-outdoors nature of a cave, we cannot have any animals using the restroom inside the caverns, so they must be small enough to be held through the entirety of the tour. What should I wear inside DeSoto Caverns? The temperature inside the cave is 60°F year-round. In the summer, it will be refreshingly cool, and in the winter it will be a comfortable warmer temperature. Because the entrance to our cave is a steep ramped tunnel we recommend wearing shoes with traction on the bottom, although there is a handrail for steadying yourself if your shoes are smooth on bottom. Does it rain inside the cave? It does not rain inside the cave. Although, because this cave is still growing you may experience getting dripped on occasionally. We like to call these occasional drips "cave kisses."